The E-Stim BiCable is a custom moulded cable with a 3.5mm mono jack plug that terminates with colour coded 2mm and 4mm plug. It has been specifically designed to allow you to mix electrodes which have both a 2mm and 4mm connection. It's ideal for connecting Monopole electrodes such as our Electrowhisker, or a urethral sound with a sticky pad or 2mm conductive rubber loop as the second contact point, but the variations are endless and the choice is yours! Connects your electrodes to your E-Stim power boxes or control units from Folsom, PES and ErosTek. The cable measures 1.5M in length. 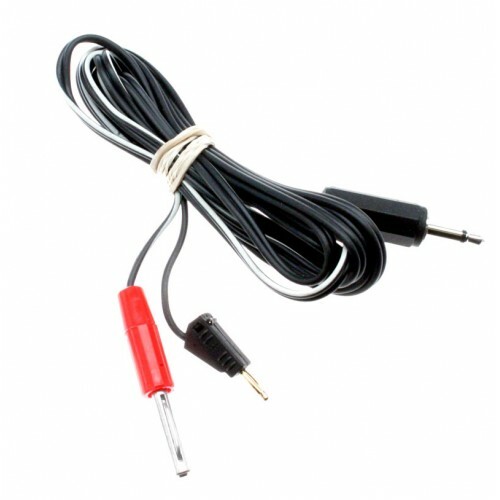 Metric 3.5mm mono jack plug with a 4mm and 2mm plug x 1.5M cable length.